As students at Cardiff University, it’s likely that you know every nook and cranny of the streets of Cathays by now. We all know Cathays for better, for worse. On nice days, with everyone on their way with a drink in their hand to relax in Bute Park. On those miserable rainy days when we trudge to boring lectures. But one thing is certain as our period as Cardiff University students comes to an end – I wouldn’t change anything about the world. Bute Park – There is more to Bute Park than large empty fields that only are filled every now and then when the sun is shining, and everyone arrives to sunbathe. The bridge near Pontcanna Fields is worth seeing, and the monster that raises its head to watch over the people in the park is enough to frighten anyone in the evening when it is dark. 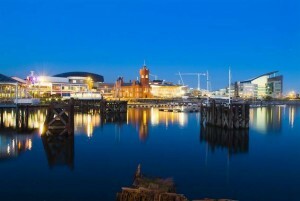 The Bay – If you would like a meal in a luxury restaurant, or are keen to wander around the docks, Cardiff Bay is a special place to escape from the hustle and bustle of the city. The Millennium Centre – Again, in Cardiff Bay, the Millennium Centre is an extremely beautiful building and if you want to go to see West End standard of show, this is the place to go. The Millennium Stadium – The Land of Song is famous for its sport, and all of the city’s Welsh people come together on rugby days (and football recently!). If you want the atmosphere of the game without having to pay the cost, go along to the St Mary’s Street during the day, and then in the evening, and you will experience a taste of this amazing and unique atmosphere. Watch for more blog post from me in due course!